Google has discontinued the Google Earth Plus version which cost $20/year. This move is not surprising because there were only two primary features in the Plus version not already in the free version: GPS support, and limited spreadsheet input support. 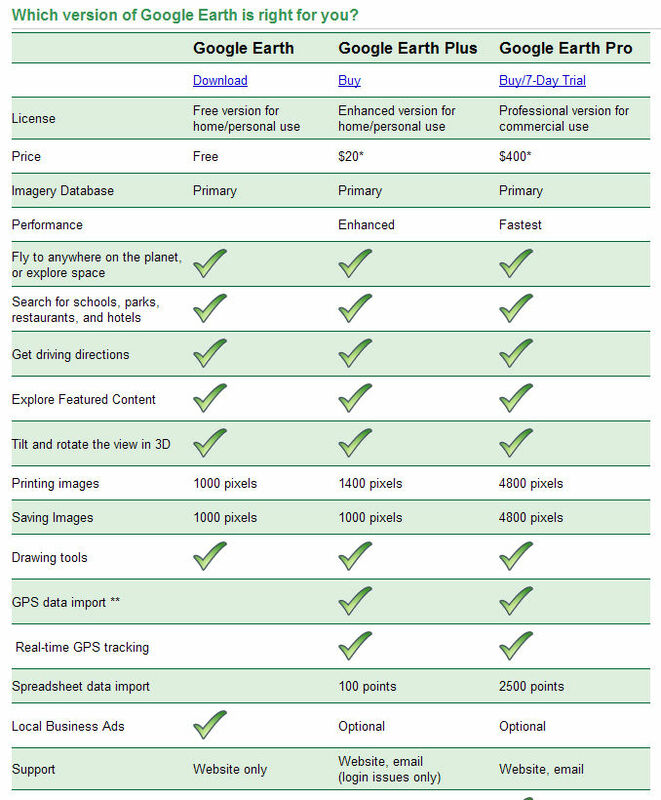 Both of these capabilities are possible to do with the free version of Google Earth with other tools (free and/or for moderate one-time costs). And, Google states in the announcement that they will be including GPS features in the free version of Google Earth in a future update. Also, for those currently paying the $20/year subscription to GE Plus, Google is offering a deeply discounted subscription to GE Pro for $99 (instead of the regular $400 price). Google is also offering a two-month free trial of GE Pro. Here is a saved view of the web page comparing the different GE versions (including Plus). via OgleEarth. Did you notice that Ed Parsons, a Google employee, posted a note that promotes the GeoServer as on-par with Google’s own Google Earth Enterprise server (http://www.edparsons.com/2008/12/looking-for-a-google-earth-server/). I wonder if that isn’t a foreshadowing of that product’s removal from the marketplace. It would make a lot of sense for Google to cut this product from their offering too, since they’re not really in the hardware and services business, and they don’t have much of a sales support staff to service the product. I did a google search to read about the possible upgrades to google earth and read google plus was no longer available. now when I click my icon for google earth I get google plus and am asked for a login…..help, how do I get back to Google Earth? I have a new computer and I am a subscriber to google-plus till Jan,what can I use till then since Plus is no longer available??? Uh, you’re forgetting the most important feature of Google Earth Plus — priority bandwidth. At least that was the main reason I was paying for it. This is an example of going overboard with free features. I think entrepreneurs these days get suckered-in by generation-X/Y sick sense of entitlement to everything being free. That’s right, heaven-forbid you should have to open your wallet for anybody or anything.